Winter season in progress. Wolverhampton Chess Club are recruiting now. complete. Wolverhampton Chess Club are recruiting for 2016/17 season NOW! Announcing subscription reductions for 2016/17. Join for just £15! Become a chess club member for just £15 a year (casual member/play social chess.) Juniors and those in Full Time Students £15 a year inclusive of ECF membership option. Club subscriptions 2016/17 Were set at our club AGM 05/05/2016 and are now due and recruiting now for 2016/17 season..
£35 full member: inclusive of ECF Bronze membership and membership of Wolverhampton West End Working men's club. £15 junior member: inclusive of optional ECF Bronze membership and membership of Wolverhampton West End Working men's club. 2015/16: Welcome aboard our latest new members Bernard and Michael Oakes. Recruitment is continual, new members can join anytime during the year on a pro rata basis. Early payment discount and flexible instalment payment options available. Very sad Tragic news : My nephew liked to play chess with me and attended our chess club a couple of times. here: By Paul Walters. Colin Bourne Jones passed away peacefully June 3 2011 aged 75 years. Donations to Cancer Research c/o F W Collins and Son. Sadly missed but fondly remembered by all his Friends and Family. Congratulations to Robert Marshall WDCL Rock finalist who may retain the WDCL Rock Cup in the rematch against A McCumiskey of Mercia. BDCL Div 2 Champions. Well done all and to BDCL Caps Phil Bull, Frank Wood and WDCL Cap Gordon Sands. at Himley Hall and Park, Dudley. WDCL Div 2 team promoted to Div 1. BDCL Div 2 team promoted and top of the league. WSL B in Div 3 : Rushall are beaten 0.5 - 3.5 and a solid match draw against an undefeated Bushbury C. 24/06/2014 Halesowen are beaten 1.5 - 2.5 following wins from Lewis Clarke, Paul Walters and a draw from Barry Lewis. We lose at Mercia but beat Brewood B 2 days later on 11/07/2014 to go top of Div 3. Great match, two solid draws and 2 wins against rival title contenders who were joint 1st with us. Well donw all. BDSL (Rapid U560): Impressive win against Bushbury, lost at Mutual Circle. Congratulations to Phil Bull Wolverhampton Chess Club Champion 2013/14 and to Dave Wightman for being a most worthy contender. Great breaking NEWS Another Champion at Wolverhampton! Lewis Clarke becomes County Junior U14 Champion after scoring a perfect 6 out of 6 against some higher graded opposition. 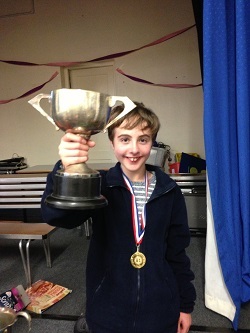 Lewis Clarke won the title and championship cup at the Staffordshire Junior Chess Championships for Under 14s. With an impressive 6 wins in his 6 match games he was the clear winner. The turning point in the tournament was in Match 4 where he was playing black against Alexander Jarvis of Rushall, who is graded 114 to Lewis on 105, when Lewis managed a check against white whilst trapping whites Bishop which ultimately led to the victory. Lewis then continued his impressive form securing further wins in the two remaining tournament games. As of 7th of April 2017. Les Hesbrook Trophy (highest WDCL percentage in assigned team, minimum 6 games ) : Frank Wood 75% in tied team. Club Championship : Awaiting details. 3rd Jacob Smith (Leek) 4pts. Junior Players from all around the Staffordshire region take part in this event each year including players from the England Junior team. The standard is very high and this is a most impressive result. This is the 49th year of this Cup which was originally commissioned by John Thompson Ltd of Wolverhampton. Lewis joins an impressive list of Junior Chess champions dating back to 1965. Lewis had a brilliant day, if he can continue at this standard he should have a good season with Wolverhampton. Lewis also won his first round WDCL Rock Cup match against Michael Hoare (Lichfield). In our final WDCL Div 1 match 03/04/2014 of the season and with relegation a distinct possibility. Wolverhampton play host to a strong Walsall Kipping team. A great match with tense battles. The 4 - 2 victory escapes relegation and so we stay in Division 1! Well done all and to our WDCL Div 1 captain Frank Wood. Read all about here blog and see all scores on this site. See you at the Walrus event in May. 23/01/2014 WDCL B team travel to Lichfield to face their 2nd team in Div 2. We defaulted board 6 due to late unavailability but still achieve an impressive 2 - 4 win against a strong Lichfield team who outgraded us on every board. Well done Wolverhampton and particularly to Lewis Clarke, Geoff Rosser,Gordon Sands (cap) and to Peter Pearson Jones for winning their games against higher graded players. full results on this site..
09/01/2014 Warley Quinborne gain a 1 point lead but 3 adjournments will decide the match in WDCL Div 1. 06/03/2014 WDCL Div 4 C team : 2nd place Lichfield C visit and are held to a draw. Lewis Clarke, Barry Lewis drew, Paul Walters won to yield 2 points on the night. Lichfield C remain 2nd and we're 1 point behind in 3rd place but with 2 matches to play and 4 points up for grabs and permutations galore. Other news Lewis's draw puts him just 0.5 points behind Geoff Rosser in the highly contested race to gain the our prestigious W N Boydon Trophy. 18/02/2014 WDCL Div 4 C team move up to 2nd in the table with 5 wins, 1 loss. WDCL Div 4 C team beat Halesowen D 2.5 - 1.5 and equal the score from 13/02/2014 Warley Quinborne Away. WDCL Div 2 B team lost to a Boldmere St Michael's A. Well done all. full scores on site. Next week our WDCL A team play Halesowen A at home and our C team will be in action again away playing Halesowen D. Watch this space. WDCL A Halesowen A Match Report/Blog added 21/02/2014 and to new main menu blog link.4/12/2013 Another week of success for Wolverhampton. This time in WDCL Div 2. Top of the division Rugeley played host to Wolverhampton and fielded a strong team that considerably outgraded us on some boards but the final score of the night was 2 - 4. P Pearson Jones, Phil Porter, Geoff Rosser all won their games and Peter Griffith and captain Gordon Sands drew. full scored in WDCL section of this website. Well done all! Pittaway Cup Winners 01/04/2014 Wolverhampton play a strong Kidderminster team and 2.25 handicap. Well done Wolverhampton, captain Peter Pearson Jones and his team. full scores on this site and in our club blog. Read all about the epic match here. Match Report/Blog and thank you to Mercia for hosting. BDCL Individual Final (Div 2) Dave Wightman won the Div 3 individual cup last year and made the Div 2 final this year. Alas Dave didn't win but it's a tremendous achievement to become a Dív 2 finalist and Dave is still a multiple champion. blog and retains the Rock and Robert Ward memorial trophy after beating Frank Wood in the 01/05/2014 final. BDCL Div 2 individual: Dave Wightman also wins his BDCL Div 2 individual Semi Final trophy match against Against Arthur Kent. Well done Dave, BDCL Div 2 individual Finalist. Read round 2 and Semi final match reports here. Well done all. Wolverhampton become WDCL Pittaway Cup finalists as Telford advance default their Semi final match with us and withdraw from WDCL. Good season and Wolverhampton are in a 4 way playoff 06 May 2014. Wolverhampton DDCL Div 2 Champions! DDCL Div 2 24/03/2014: Geoff Rosser's team faced Rushall 24/03/2014 and win with a solid 0 - 4 scoreline. This final match win adds to an impressive tally and our DDCL Div 2 team remain undefeated all season with 5 wins , 1 draw. Well done Wolverhampton captain Geoff Rosser and all players. full scores in DDCL fixtures section. 08/01/2014 In CDCL Div 3 Wolverhampton beat Boldmere St Michaels. 18/12/2013 Unbeaten run of success continues at Brewood. Our DDCL B team win 0.5 - 3.5 and maintain their unbeaten record with 3/3. full scores on this site. Well done all. Other Club news :. Wolverhampton Chess Club has a New Champion 2012/13! A BDCL Div 3 individual champion (first in 90 years), winner of WDCL Bidgood Cup & CDCL Robert Ward memorial Trophy plus several club AGM Trophies. Well done Dave Wightman. WSL A in Div 2 : Rugeley are beaten 0 -4 in match 1. WSL B in Div 3 : Rushall are beaten 0.5 - 3.5 and a solid match draw against an undefeated Bushbury C. 24/06/2014 Halesowen are beaten 1.5 - 2.5 following wins from Lewis Clarke, Paul Walters and a draw from Barry Lewis. Super GM Simul 01/03/2014 Gordon Sands played Michael Adams GM at Telford. Well done Gordon Sands.on a fine game and for taking part in this once in a lifetime event. Game score to appear here soon. Jan 2014 Shropshire Congress A number of participants from Wolverhampton Chess Club. Well done to Gordon Sands, Geoff Rosser and especially Phil Bull for achieving 2nd place in the Major. Wolverhampton Chess Club's fifth consecutive year at the huge and ever popular Wolverhampton, City Show. Chess in The Park 2013 turned out to be be the best ever! and see Wolverhampton Show Section of this site for more details of 2013 and previous years shows. Sadly Chess in The Park 2014 is very unlikely due to funding issues. Details and entry details are on display in the cupboard at the Chess Club. Entries are invited for 2013/14 Club Championship. To enter add your name to the Club Championship sheet in the chess club cupboard or email Dave Wightman (Competition organiser by 6 Sept 2013) Draw pairings to appear in the following table. Latest : Phil Bull becomes Wolverhampton Chess Club Champion after beating Dave Wightman after initially drawing match 1. See Events Sections for full details and forthcoming club events throughout the Winter season! BDSL Summer League: We have a team in the Open section. Good luck all. Delighted to announce further reductions in subscription categories. Join from just £15! See Subs section, email or call for more details or attwnd club with no pbligation to join. DDCL Div 1 team withdrawn. WDCL Div 2 team win 3 out of 3. We narrowly lose round 1 Pittaway against Lichfield be we draw in CDCL 26/11/2015. WDCL Rock Cup final: Robert Marshall (B) drew with Andrew McCumiskey (W) at Rushall 13th April. Colours were reversed for the 01/05/2015 rematch. Congratulations to Robert Marshall on winning the rematch and Rock Cup for Wolverhampton. WDCL Bidgood Cup final: Mike Groombridge (W) 1 Lewis Clarke (B) 0. Well done Lewis Clarke on progressing to the final. National Club Championships: 11th and 12th April at Holiday Inn near Birmingham Airport. Wolverhampton drew against GLCC and Warley Quinborne in the first two rounds. Well done all. Also refer to club blog for match reports and special features and new match and trophy sections. History section expands with content tributes : Bert Preist, W N Boydon, Mark Duffy, P S Walkins and Cooke family sections added Thank you to Keith Bate and all contributors. WSL Div 3: Our WSL B in Div 3 beat Rushall B 0.5 - 3.5 02/06/2014 and achieve a solid draw against Bushbury in match 2. WSL Div 2: An impressive 0 - 4 win at Rugeley. Well done all. full results in WSL section. Walrus 2014 15/05/2014 : Wolverhampton win Walrus and deprive Walsall Kipping of an hat trick at Wolverhampton. In an historical repeat of 2011 Paul Walters is the last board playing and the board result is decisive. A loss would of a resulted in a Rushall victory. Wolverhampton were outhr aded on some boards and had the lowest combined grade total. Wins against higher grades for Barry Lewis, Steve Wilson, Paul Walters and solid draws for Lewis Clarke, Peter Griffith and solid draws from Peter Jones, Dave Wightman and Peter Griffith equalled last year's winning score and elevated Wolverhampton just 0.5 points above 2nd place Rushall. Well done all and thank you to to all teams and players for making it an exciting and memorable night of chess battles. full scores in Walrus section. BDSL (rapidplay) and WSL Summer (standard) leagues in progress. Wolverhampton's begin their BDSL season playing Bushbury 07/05/2014 and win 2 - 6. BDSL club fixtures and a new WSL 2014 section including fixtures, full scores, tables and more are on this site All WSL and club fixtures and BDSL club fixtures on this site. Congratulations and well done to all. Wolverhampton win WDCL Pittaway Cup and Rock Cup Blog (Dave Wightman) and retains the CDCL Robert Ward Memorial Trophy Blog. Wolverhampton also are DDCL Div 2 Champions 2013/14. BDCL Div 2 : Top of the league Solihull A are held to a draw and thus Wolverhampton will play a 4 way play off Tues 06 May 2014. Best of luck to all. Staffordshire Congress Success 2014 12 & 13 April 2014 at Bloxwich Leisure Centre. Congratulations to Staffordshire Congress participants, particularly to Jonathan Hunt on winning the Major U160 and Thomas Sygnowski on jointly winning the Open. Gordon Sands also played well in the Minor. Well done all! Wolverhampton Chess Club entrants at this years county congress. Phil Bull, Jonathan Hunt, Peter Pearson Jones, Geoff Rosser, Gordon Sands. A New Club Champion : Phil Bull becomes Wolverhampton Chess Club Champion after beating Dave Wightman after initially drawing match 1. Congratulations and to Dave Wightman on being a worthy finalist and great forner Club Champion. Club Championship: Wolverhampton Chess Club has a New Champion 2012/13! A BDCL Div 3 individual champion (first in 90 years), winner of WDCL Bidgood Cup & CDCL Robert Ward memorial Trophy plus several club AGM Trophies. Well done Dave Wightman. Can Dave Wightman retain his Club Champion crown? An epic final Phil Bull v Dave Wightman will decide who is the 2013/14 Wolverhampton Chess Club Champion. 19/12/2013 Christmas Rapidplay. Well done to Parminder Sanghera who scored 3.5/4 conceding just 0.5 points to Gordon Sands. The event was arranged at short notice and filled the gap for Pittaway Cup Semi Final that was scheduled for the same night, but Telford withdrew. Well done all and thank you to all who turned up on the last club night before Christmas. Spring Rapidplay: Thurs 07 March Wolverhampton Chess Club Spring Rapidplay. The question was asked here could Robert Marshall retain his Spring Quickplay Crown. Mike Townsend led by just half a point (4/5) going into the last round against Robert Marshall (3.5) The game was a thrilling battle which ended in a draw. Hence, Mike Townsend becomes the Wolverhampton Chess Club Spring Rapidplay Champion 2013. Robert Marshall a very respectable 2nd place with 4/5. Phil Bull achieves an excellent 3rd after drawing with Robert Marshall in the early rounds. Well done Mike and all. Also thank you for Steve Wilson for organising the event. WDCL Trophy News Wolverhampton have four contenders for 2013/14. Peter Tudor, Peter Griffith, Geoff Rosser and former Rock and Bidgood Cup winner Dave Wightman. Current Rock Cup holder Robert Marshall hasn't entered this years competition. Peter Tudor, Peter Griffith and Geoff Rosser lose respectively to Peter Banks. Dave Amour and last years Rock Cup finalist Mike Groombridge. Dave Wightman progresses to round 2 after beating S Heath. Gordon Sands draws with Lee Collier.